The Children’s Book Council is calling on booksellers, librarians, and teachers to sign up to be an official event host during the 100th anniversary celebration, which will take place from April 29 to May 5. On Thursday, January 3, the January Indie Next List e-newsletter, powered by Shelf Awareness, will be delivered to more than 519,000 customers at over 130 ABA member stores. Booksellers, authors, publishers, distributors, and others with ties to the book industry are invited to submit nominations for Publishers Weekly’s Bookstore and Sales Rep of the Year awards by January 8, 2019. Make sure your coworkers stay in the know by signing up for BTW. In the weeks to come, BTW will report on Winter Institute, new bookstore openings, industry news, and more! Next month, The Bookshop Band will be playing at bookstores throughout the United States and making a special stop at Winter Institute 14 in Albuquerque. James Patterson announced the names of the independent booksellers receiving grants totaling $250,000 as part of his Holiday Bookstore Bonus Program. 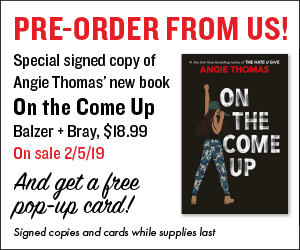 Booksellers who received January’s flier will notice ads urging customers to pre-order On the Come Up by Angie Thomas and Reclaiming Our Space by Feminista Jones from their local indie to receive a free gift. Booksellers from all over the country are praising the work of the Book Industry Charitable Foundation, which began its annual year-end fundraising campaign last month. Retail sales at U.S. bookstores were up by 7.7 percent in October 2018 compared to October 2017, according to preliminary figures recently released by the Bureau of the Census. As of December 19, the year-to-date sales among ABA member stores, as reported to the weekly Indie Bestseller Lists, are up nearly 5 percent over 2017.